This fish curry is thick, aromatic, and addictive. It is no wonder the late Tunku Abdul Rahman requested this dish on a daily basis. 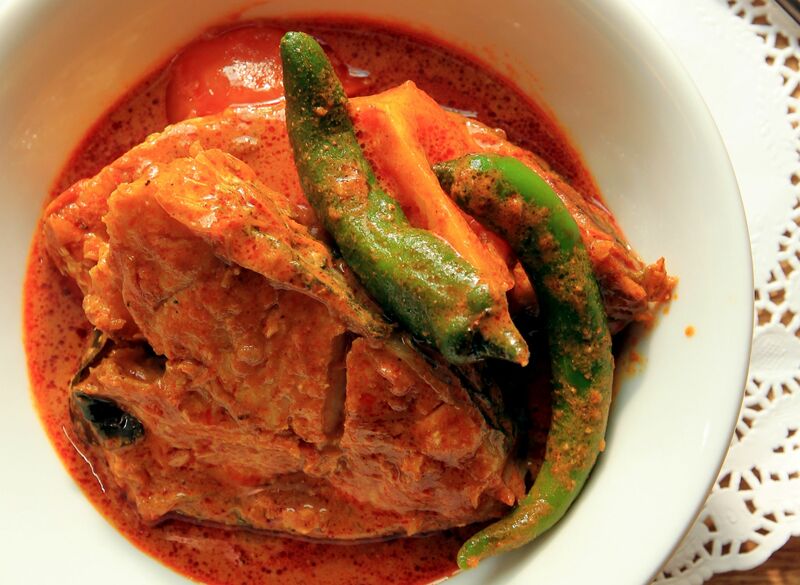 His post-retirement cook of 22 years, Salmiah shares with us her version of the classic Fish Curry. Roughly cut 5 shallots and 3 cloves garlic and pound them together in a pestle and mortar. Add the curry powder and continue pounding until the mixture forms a paste. Finely slice the rest of the shallots and garlic and set them aside. Heat up the oil, and fry sliced shallots, garlic, fenugreek mix, and curry leaves. When shallots start turning yellow, add in pounded mixture and half a cup of water. Stir regularly until fragrant. Add tamarind water and bring to a boil. Then add santan, two cups of water, and salt to taste. Once the mixture has come to a boil, add the fish and tomatoes. Cook for about 10 minutes, until the curry comes to boil. Remove from heat and serve.